Homecoming will be "under the lights" on Friday night, September 28, 2018 ! BUCS! Save the date! Homecoming will be "under the lights" on Friday night, September 28, 2018. Time to be determined. If you are planning a reunion or any sort of gathering this has been traditionally a fun weekend to make plans with classmates. MBHS will host a tour of the "old stomping grounds" prior to the football game and there will be reserved alumni seating in the stands as well. The MBHS Alumni Association is proud to announce $10,000 donated to MBHS from proceeds of Phase 1 of the engraved brick fundraiser! All Alumni Homecoming Celebration 2017! Join us on Friday, October 28, 2017 for our Homecoming Celebration ! Take a trip down memory lane and check out whats new at MBHS too -- it is impressive! Tour starts at the weed patch outside the auditorium. All alumni and guests are welcome! 5PM: All Alumni Homecoming "Pre Game" Celebration inside our fabulous new stadium in the patio area between concession stand and the bleachers. Beat the crowd and come early to the game to catch up with classmates. Food will be available to purchase and MBHS spirit wear on sale. Admission to the game is free for all MBHS Alumni Association Life Members and senior citizens. Regular admission $7.00. There will be a designated seating area for all alumni in the bleachers just off the patio area. 6PM: Just before kick off off MBHS Alumni Association will be honoring alumni Sean Smith MBHS '95 who was an information management officer with the United States Foreign Service and was killed during the September 11, 2012 attack on the U.S. consulate in Benghazi, Libya. We will also be honoring our former MBHS Principal Maruta Gardner who was tragically struck by a hit and run driver on February 12, 2016. Please help spread the word with your classmates and friends ! Due to the ongoing construction of our fabulous new $12.5 stadium, this year's game vs. La Jolla High School will be played at University City High (6949 Genesee Ave.San Diego, CA 92122) on Friday, October 24th at 5:30PM. Because of the game relocation, we are modifying our annual "All Alumni Homecoming Celebration" tradition this year. If you are attending the game, there will be a designated alumni seating section so we can all cheer the BUCs on to victory together. Immediately following the game we will be hosting an after party featuring the talented Jetpack Mojo (with MBHS alum musician Greg Fararr '81) starting at 8:30PM at the Blackthorn Irish Pub and Grill (3010 Clairemont Drive, San Diego 92117). There is NO cover charge and this is an all ages venue. There will also be a raffle to benefit MBHS Alumni Association. Please help spread the word with your classmates and friends...are are welcome to join in the fun! The Mission Bay High School Alumni Association is preparing to celebrate the grand opening of their Seaside Farmer's Market on Saturday, March 16 from 10am-2pm. This weekly event is open to the public and will be held in the west student parking lot at Mission Bay High School 2475 Grand Avenue with 100% of the profits to benefit Mission Bay High School. In addition to artisans, delicious food and produce the Seaside Farmer's Market will be unique in that a community section will be featured for all local Pacific Beach cluster schools to fundraise, perform, and spread awareness. This area will also be offered to community organizations such as animal rescues for adoption events. The Seaside Farmer's Market was created by MBHS Alumni Cori (Smith) Meara who also is the MBHS Alumni Association Vice President. Meara has been active in the Pacific Beach public schools for over 13 years with two children currently enrolled. Meara said "I have been fundraising for so many years for our schools. It has always been a dream of mine to develop a consistent, substantial revenue generating source for MBHS so we can really make a difference. Most of all, our location is ideal. Not only is the community excited to have all the free parking but vendors especially appreciate being right off Grand Avenue close to the soccer and little league fields with all the Saturday family activity." The Seaside Farmer's Market will feature unique artisans, delicious food, produce and a community showcase area for local schools to fund raise and raise awareness. Alumni support is appreciated to help us create a highly profitable venue in support of our school! For more information on the Seaside Farmer's Market contact Market Manager Cori Meara via email at cmeara@sbcglobal.net or visit our Seaside Farmer's Market Facebook page. 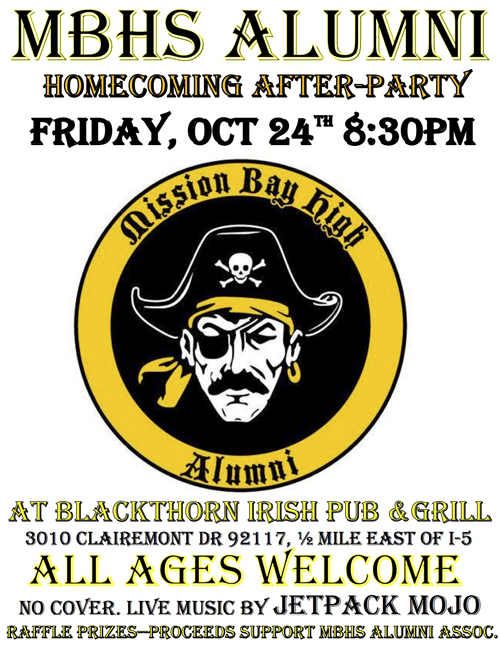 The MBHS Alumni Association will be hosting our 6th Annual All Alumni Homecoming Celebration on October 19th at 3PM vs. La Jolla High at MBHS. This event is complimentary with paid admission to the game and is open to all MBHS alumni and staff. As in the past, we will have our popular VIP tents, snacks/beverages, alumni merchandise and prime end zone seating for the game. There will also be a silent auction which is our major fundraiser of the year. It would be greatly appreciated if our fabulous BUC alumni would please donate services, certificates for merchandise or funds to help underwrite costs as we need your support this year. 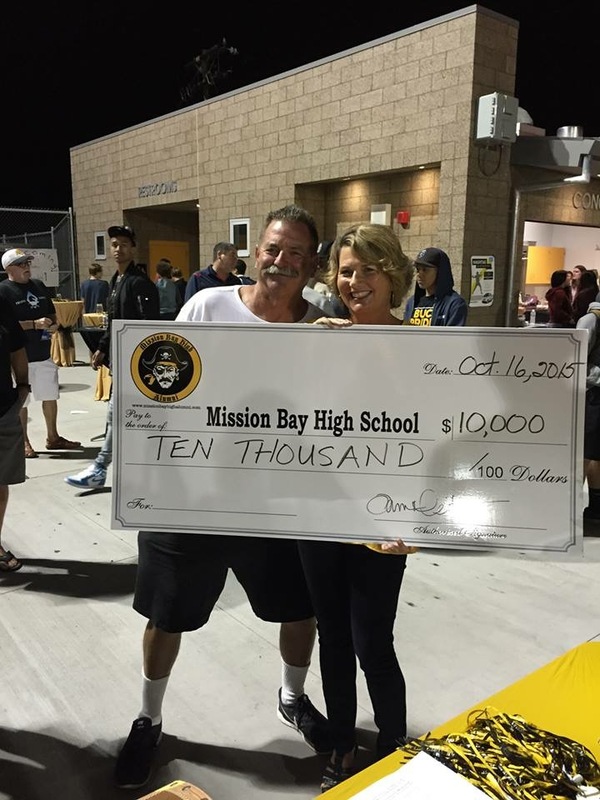 In light of the drastic San Diego Unified School District budget cuts, the MBHS Alumni Association's financial role in supporting MBHS is even more critical. 100% of the proceeds from this event support MBHS as we are 100% volunteer based. The Donation forms are below, just click to open and download. If you need help just contact us via email at mbhsaa@earthlink.net and we will email them to you. Over 70 alumni from the Class of 1961 were on hand at this year's All Alumni Homecoming Celebration to celebrate their 50th reunion and cheer the Bucs on to a 17-14 win over Serra. Just prior to the game, Principal Fred Hilgers let the Class of 1961 on a VIP tour of the school and everyone enjoyed their trip down memory lane. Go Bucs! If you have not joined us yet for homecoming, out VIP tents and prime seating are located in the end zone of the field and, win or lose, it is a fabulous spot to enjoy a day of Buc football. This year’s auction and alumni wear sales brought in over $2,000 and we welcomed over 37 new members! Thank you to our special volunteers ! Thank you to MBHS staff ! Thank you to the following businesses below who donated items for our silent auction or services for the event - remember the best thank you is to support those with your business who support us! The MBHS Alumni Association is proud to introduce the MBHS Black Alumni Alliance. 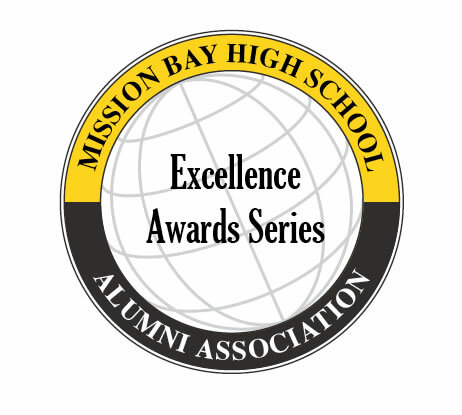 WHO: Alumni, family & friends of Mission Bay High School. Everyone welcome. WHAT: Party with a Purpose! Win an iPhone, Charger tickets, signed Charger memorabilia, and much more. WHERE: TimeOut Sports Bar, 634 Broadway (btwn 6th/7th), Downtown SD, owned by fellow Buccaneer Peter Guerrero. WHY: Have fun (see old Prom videos!! ), reconnect and raise funds to improve our families and communities. Funds go toward the 1st Annual “College & Career Night” scheduled for Nov 8th,2011 hosted by MBHS Black Alumni Alliance at the Malcolm X library in Southeast SD. Contact FollowTheLeaderFoundation@gmail.com for more information. Mission Bay High School is reviving the surf team for the 2011-2012 season. MBHS alum and teacher / coach Greg Farrar is the new advisor for the team and would like to put together a fun, competitive team ASAP. The team held its' first meeting Wed. 9/14 and had a great turn out of 22 MB student surfers. The team will compete in the Scholastic Surf Series this year. The season will consist of 5 top notch contests throughout San Diego County beginning in October and ending in March. The surf team is in need of sponsorship and donations to cover the Scholastic Surf Series team fees of $1500.00 by Oct. 1, 2011. For more information please contact Greg Farrar directly at gfarrar@sandi.net or call Greg Farrar directly at (619) 977-5834. 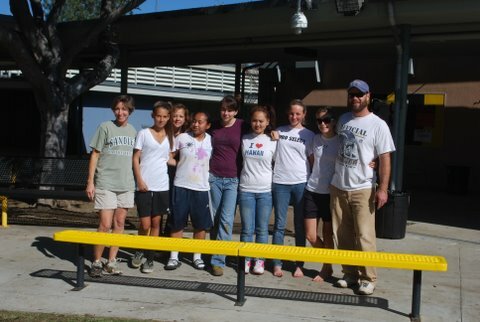 The MBHS Alumni Association is proud to announce our new 2011 Campus Clean Up Grant Sponsorship. This program was designed to reward current MBHS sanctioned student clubs and teams up to $250 per event for organizing campus clean ups at MBHS. 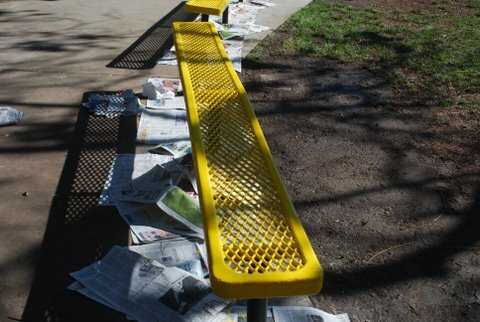 The goal of this program is to inspire a heightened sense of school pride by motivating the student's direct involvement with cleaning and beautifying the MBHS campus. This involvement and leadership creates respect and lasting sense of "Buc Pride" which is a component of the MBHS Alumni Association's mission statement. The financial component of this grant program also serves to strengthen and build the excellence of our MBHS clubs and teams. Interested student groups must have an adult supervisor and submit a grant request form to Principal Hilgers who designates an area of the school to focus on and the anticipated results. Once the clean up is completed, results will be evaluated by either Principal Hilgers or a MBHS Alumni Association Board Member. If the proposed scope of the work is completed as specified a maximum of $250 will be awarded to the group. Our Campus Clean Up Grant Sponsorship program was just announced on campus late December 2010 and has already been met with great enthusiasm. In a few weeks, we had three approved grants and clean-up events scheduled for January with the 11th grade class, the 3PointPlay Club and the Interact Club. Funding is limited, however, for future clean up grants and your donation to the MBHS Alumni Association to perpetuate our new grant request program is greatly appreciated. If you would like to sponsor a entire grant ($250) we will recognize you or your business with the student group sponsored, on our website, e-mails and in the MBHS Beachcomber. Please designate your checks with "Campus Clean Up Grant". All donations are 100% tax deductible. Thank you for your support and we wish you a Happy New Year! If you would like to benefit from having your business message prominently displayed in our MBHS gym the Banner Ad Campaign has availablity and accepting new ads which will be prominately displayed in the gym for the duration of 2011. These ads are viewed by thousands of MBHS students, parents and visitors attending our popular sporting events such as volleyball and basketball games, pep rallies and community based adult and youth tournaments. Each ad 24" High x 42" Wide and are available for a tax deductible donation of $300. 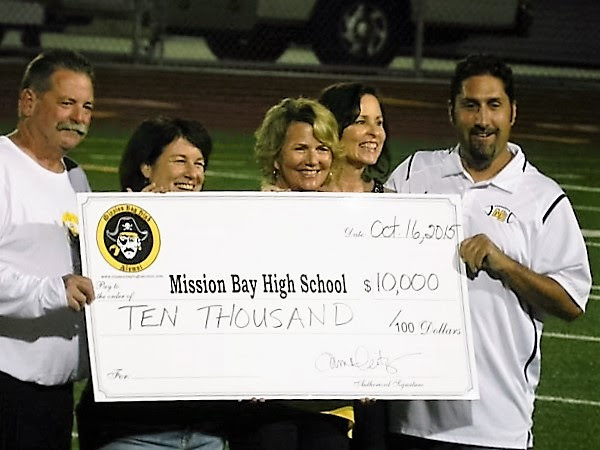 Proceeds from the Banner Ad Campaign provide much needed and greatly appreciated financial support to Mission Bay High School. The fourth annual “All Alumni Kick Off Party” was held September 24th, 2010. A fun day was had by all! Although the Bucs missed a win this year the weather compensated and we all enjoyed a beautiful day. If you have not joined us yet for homecoming, out VIP tents and prime seating are located in the end zone of the field and, win or lose, it is a fabulous spot to enjoy a day of Buc football. This year’s auction and alumni wear sales brought in over $2,000 and we welcomed over 30 new members! The list below is an inventory of yearbooks available at MBHS with a cost of only $40 per yearbook plus shipping. Please contact Matt Moody at mmoody@sandi.net for arrangements and delivery. Thanks to a generous $500 donation from the Pacific Beach Town Council and a matching contribution from alumni Howard and Lisa Barton, Friends of Pacific Beach Secondary Schools and, of course, the MBHS Alumni Association our historic logo project on Grand Street is completed and looks fabulous. The logos were painted on the front of the Administration Building on Grand Avenue and include the International Baccalaureate logo, the beloved peg leg Buccaneer, the Buccaneer with the sword in his mouth and a "MB" logo used on many of our sports team wear. The artist, Tom Plonka, also spruced up the Buccaneer on the auditorium that was fading and repainted the knife into his mouth that had been removed many years ago due to zero tolerance. Tom also spruced up the Mission Bay High School logo on Lee Street, added "Home of the Buccaneers", "est. 1953" below it. 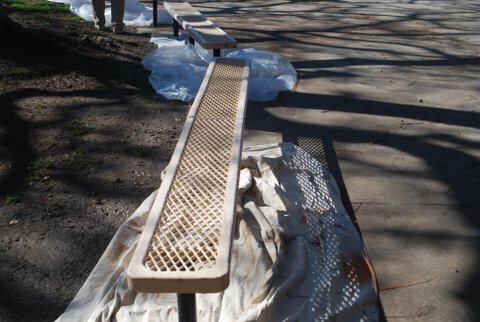 Thank you to Frazee Paint for their donation and to all who so graciously made this beaufication project happen. A special thank you to Cori (Smith) Meara who spearheaded this project by approaching the Pacific Beach Town Council and worked diligently with Principal Hilgers and the artist to get all approved. The 3rd Annual "All Alumni Homecoming Celebration" a big success! : This year's All Alumni Homecoming Celebration not only had a record turnout but raised over $3,000 and, better yet, we had over 90 new members join the organization. SEE THE EVENT PHOTOS BY CLICKING HERE ! The MBHS Alumni Association would like to put every MBHS yearbook online ! There are already some yearbooks on this website and more to follow when time and money allows it. 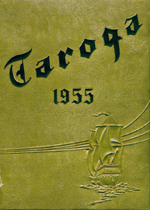 You can help by making a tax deductible donation ( this is the easy way ) or by scanning your yearbooks at 600dpi and sending us your digitized images. Please contact Pam Deitz at mbhsaa@earthlink.net for more information. Dr. Richard Schrock '63 received the Nobel Prize in Chemistry in 2005. Dr. Schrock was the first honoree in the MBHS Alumni Association's Alumni Excellence Awards Series which was held January 15, 2009. A special assembly was held in the MBHS auditorium with over 300 MBHS honor students, staff, classmates and alumni attending. As a special tribute (and surprise) to Dr. Schrock's prestigious accomplishment, the Chemistry building was dedicated in his honor. The MBHS Alumni Association is currently in search of additional participants for this series. Please contact mbhsaa@earthlink.net with your recommendations. SEE THE 2008 EVENT PHOTOS BY CLICKING HERE ! The Second Annual All Alumni Homecoming Celebration was held October 17, 2008 and, we are pleased to report, was an even bigger success than last year. Thanks to Dennis Pugh, MBHS Athletic Director, our VIP tents were again set up in the end zone area of the field which made an exciting game even better. In addition to the tents, silent auction, merchandise table and delicious food and beverages -- we had prime seating set up for the near sell out game which our alumni football fans really enjoyed. Our event is a special arrangement just for the MBHS Alumni Association and not only offered a fabulous view of the game but a great opportunity to mingle with other alumni from all years. We kicked off the Homecoming game with the Hall of Champion induction ceremony in which the Hall of Champion inductee walked through a line up of cheering football players and cheerleaders. Each inductee and their accomplishments were announced to the crowd by Athletic Director Dennis Pugh as they received their personalized Hall of Champions plaque. Current Hall of Champions and past Hall of Champions Directors attending the event were invited to attend the event and were on the field to celebrate the new inductees. Thank you to Robert Harutunian, former MBHS coach and Hall of Champion Board of Director who was a wealth of information and extremely supportive in getting this program reinstated. Also adding to this year's success were three class reunion weekends who planned activities around Homecoming - Class of '73, 88 and 98. It made the day even more festive seeing old classmates reunited. To make the day even more fun, we had the Homecoming Queen from 1958 in attendance who crowned our new 2008 Homecoming Queen 50 years almost to the day after she had been crowned. All in all, this year we doubled our attendance from last year with over 150 people joining us for the event and added 82 official new Mission Bay High School Alumni Association members. Overall, we made about $3,500 in merchandise sales, memberships and donations which is welcome "seed money" for future events.